"A significant proportion of the growth that independent advisors have experienced can be attributed to deep advisor-client relationships, which is critically important in challenging investing environments"
SAN FRANCISCO--(BUSINESS WIRE)--Independent financial advisory firms reported that they have maintained a ten-year growth trajectory despite numerous and varied investment environments, according to results from Schwab’s 2016 RIA Benchmarking Study (Study). The Study underscores the critical importance of the advisor/client relationship as the bedrock of firms’ strength and resilience, and as a driver of growth. The data also reveals that stable client relationships coupled with robust business fundamentals is a recipe for success in firms of all sizes, as technology and human capital increasingly align to drive operational efficiency. AUM rose to $588 million in 2015 from $365 million in 2011, at a median compound annual growth rate (CAGR) of 9.2%. Revenues grew to $3.6 million in 2015 from $2.3 million in 2011, at a CAGR of 10.9%. Average client size increased by nearly a quarter (22%), as advisors spent more time reassuring clients and expanding the scope of their relationships. Additionally, client retention rates remained sky-high at 97% over the period of market turbulence, a testament to the trust advisors have built with their client base over time. Meanwhile, last year roughly 75% of new clients [at firms with $100 million or more in AUM] came through referrals. A quarter (25%) of advisors reported that their top priority is improving productivity with new technology. Firm profitability was up in the last year, rising 4% from the year prior and driven by continued improvements in operational processes and technology-driven efficiencies. This continues a longer term trend reported across these firms – profitability has jumped 27% in the past five years. At mid-sized firms with $500MM-$750MM in AUM, 61% plan to add relationship managers or investment professionals this year and 57% plan to add support staff. 23% have at least one JD on staff. A third (33%) of firms that manage over $1 billion, and almost 25% of firms with under $1 billion in AUM, are actively looking to acquire. Study participants reported 208 instances of some type of M&A activity, and 149 instances of “join” activity, in the past five years. Additional industry M&A data from Charles Schwab shows that last year alone, transaction volume among RIA firms reached a ten year high of 84 deals, up 56% from 2014. 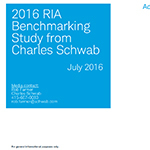 Schwab’s annual RIA Benchmarking Study is the largest of its kind focused exclusively on RIAs. This year, 1,128 firms representing nearly three-quarters of a trillion dollars in AUM completed the survey, reflecting their experiences in 2015 as well as their annual growth rates from 2010 to 2015. The study categorizes participants into 12 peer groups—seven wealth manager groups and five money manager groups—by AUM size. The results, unless otherwise noted, include all firms with at least $250 million in AUM, representing the vast majority of total assets managed by this year’s participants. All results are self-reported and not independently verified. Results from the 2016 RIA Benchmarking Study from Charles Schwab.